A lot goes in to managing money responsibly. A major part of it is ensuring that where we decide to invest stays on track – to help our clients meet their goals for the level of risk that is acceptable to them. Portfolio manager Simon McConnell reviews a typical day. There is no explicit checklist to start the day, but certainly first thing in the morning I’ll monitor various news channels and get a feel for any market-related news emanating out of Asia that may set the tone for the day ahead. I then usually identify a few relevant research pieces that hit my inbox overnight – or sometimes a podcast – to consume on the commute. London’s Central Line isn’t my favourite place in the world, but I at least attempt to make my time riding it beneficial! At Netwealth our investment views are based on longer-term thinking, so it is highly unlikely that any data which has come in would prompt us to trade immediately. Rather, I look to digest all relevant information and assess how it may impact our outlook for the global economy and the various assets in which we invest. While it is inevitably difficult to say with certainty what macro-economic environment will prevail over the medium term, we look to identify a base case outcome for various variables (growth, inflation, interest rates etc.) and highlight risks around the base case. Anything that challenges the base case – or our assessment of likely alternative scenarios – will then be discussed as a portfolio management team, ahead of conducting further research and analysis on the topic before perhaps proposing changes to portfolio allocations. Some days and weeks demand more external attention than others. Often there may be a multitude of market events to keep abreast of – whether it is central bank meetings, elections, budget announcements and so on, it is always important to keep your eye on the ball. One aspect of the Netwealth offering that I enjoy is the fact that we’re a ‘hybrid’ wealth management service – clients can have a purely online relationship with us or they have the option to meet face-to-face with our advisers. Naturally, certain clients wish to understand and discuss in detail the investment process and our market outlook and it’s great to be able to explain this to them. In my former asset management role I often felt a long way from the end client, so I particularly relish the client interaction at Netwealth, whether it be in one-to-one meetings or at the client events we host. When a client opens a portfolio online, they set their risk level for each portfolio and specify any scheduled inflows and outflows. Our portfolio management system picks these up and waits for the initial funding to take place. Once there is cash to be invested, we automatically calculate the individual trades required to invest the new portfolio in line with the set strategy. When the pre-trade checks are completed, a member of the portfolio management team releases the orders for execution. On a daily basis, each client portfolio is monitored for any ‘drift’, or deviation from our strategy target, at instrument (such as a FTSE 100 ETF), asset class, regional and currency level to ensure the portfolios’ desired exposures are maintained. This process also acts as our post-trade check for newly invested portfolios. Although our self-imposed constraints for portfolio deviations tend to be quite tight, and the trading process is efficient, we weigh the cost-to benefit of rebalancing a portfolio carefully, rather than following an automatic, algorithmic process. One of the biggest benefits of our approach at Netwealth are the operational efficiencies: managing seven risk levels allows us to devote significant time to devising each strategy. As we’ve discussed previously, in general, we don’t believe in the notion of bespoke portfolios for individual clients, or the myths surrounding them. I can only imagine that being responsible for a set of completely tailored portfolios is onerous to manage and difficult to ensure enough attention is dedicated to each client account – without an identifiable benefit. 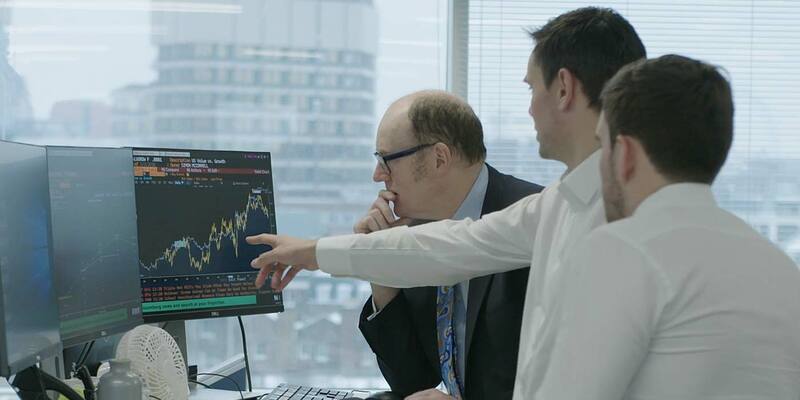 I really enjoy being part of an experienced investment team and being able to discuss markets with Iain (Barnes) and Gerard (Lyons) on a daily basis. We debate our views regularly and discuss the best ways to translate these into positions for our portfolios. Without doubt I have benefitted from their insights and approach to managing money. Being well informed is incredibly important – as such I find that different forms of media are becoming an ever more important resource. In previous roles various IT policies denied access to such websites and apps but I now find them very useful platforms for staying up to date with news-flow, reading prominent economists and analysts’ viewpoints and challenging my own. With the exception of the England cricket account (everybody needs a distraction now and then! ), I tend to only follow people who I feel I can learn from and whose knowledge will ultimately benefit our clients. One of my favourite aspects of the job is that no two days are the same and you constantly have to be aware of real-world events – which are often unpredictable by nature – and then assess the likely impact on portfolio returns. While we never make any knee-jerk responses, we must maintain our vigilance and constantly look out for information that challenges the status quo. The downside is that you are constantly analysing: managing global portfolios requires being clued up on events that are happening in different regions and time zones. Yet it is essential to have downtime, where the phone or iPad is tucked out of sight, so I like to exercise or watch TV and reinvigorate the brain cells. In this respect – and you could argue it is not exactly switching off – I also like to read books written by successful investors to learn from their approach, or occasionally academics who challenge many of the concepts that have been prevalent in the financial industry for decades. I am currently reading ‘The Most Important Thing’ by Howard Marks1, which has reinforced several key messages to consider as an investor. In particular, avoiding overconfidence, being aware of the dangers of extrapolating current trends in the business cycle into the future and demonstrating the ability to resist excesses is advice that resonates strongly with our investment approach at Netwealth. 1Howard Marks is the chairman and co-founder of Oaktree Capital Management, a Los Angeles based investment firm with $80bn assets under management.